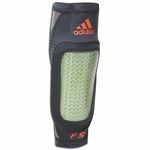 Adidas Shin Guards  find your best option. Which of the Adidas Shin Guards should you buy? Let me assist you with making the right selection. It shouldnt be too hard, since there are only few models worth considering. To make it even easier, I have divided them into two groups: with or without ankle guards. Hopefully you already have your mind set up on which type you prefer. Comfort and protection in soccer shin guards are somewhat mutually exclusive. In other words: more comfort-less protection and vice versa. Shin guards with ankle guards will give you extra protection, however anything thick, insulating and bulky on players feet (ankles included) will reduce the feel of the ball and interfere with his/hers performance on the soccer field. PU hard-shell front plate with EVA foam padding. Size: S: 5.5, M: 6", L: 6.5"
Tip ! This is probably the best choice for those whom comfort...and money are the most important. The Predator Lesto are very light and the least expensive of all Adidas soccer shin guards. As a matter of fact I think they are the cheapest shin guards, period. Besides, PU is a highly resistant material, so no worries about having no protection at all. Size: XXS: 5.5", XS: 6", S: 6.5, M: 7.5", L: 8.5"
Tip ! Basically these Adidas shin guards are the Predator Lesto with dual straps. I am not sure why the weight is exactly the same (I have checked few different sources). Logically, because of these two straps, the Predator Lite should be a bit heavier than Lesto. At least there is a logic in prices: two bucks more for the straps. Shock-resistant Polypropylene (plastic polymer) shell. Polyester lining for comfort, soft feel and some cushioning. Some retailers want you to believe the sleeves are free of charge. But nothing is free. The cost of these sleeves is calculated into the price of shin guards. These shin guards themselves shouldnt cost more than $5-$7. And the sleeves? and tape (if needed). You dont want to put the sleeves and the socks over your shin guards together. Well, at least I wouldn't. But these Adidas shin guards are the lightest and might give you little more comfort (without sleeve) than the Adidas Predator Lesto, although a bit less protection . Two interlocking protection layers of Thermoplastic Rubber (TPR). EVA and polyethylene padding with ClimaCool lining . Tip ! This one is not my favorite but because of its uniqueness I've decided to include it in my recommendations of Adidas shin guards. Besides, I know some players prefer tight sleeve fit, so there you go...shin guard and sleeve, all in one. The protective front shield is permanently integrated into a compression sleeve. Soft synthetic lining and single strap. Ankle guard  not removable. Size: XS: 5.75" S: 6.25" M: 7.25" L: 8.5"
Tip ! 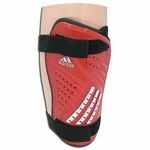 Not too heavy for this kind of shin guards with quiet few choices of different sizes and colors for reasonable price. 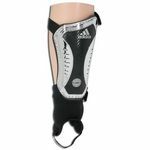 Unfortunately the ankle protection part is not detachable, therefore be absolutely sure this is the type of shin guards you really need and want. 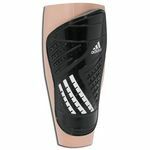 Otherwise choose the one without ankle guard or get the shin guards with removable ankle protection, like AdiPure below. Hard shell front plate with Eva foam backing material. Soft synthetic lining with dual strap. Size: S: 6" M: 7" L: 8"
Tip ! The lightest of all Adidas shin guards with ankle sleeves (guards). 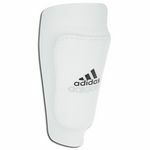 Therefore probably one of the most comfortable soccer shinguards of this type for a very affordable price. ...detach the ankle guard, if it is too bulky and not too comfortable. Size: S: 6.25" M: 7.25" L: 8.5"
Tip ! Does anybody know what is the difference between the AdiPure Chrome and AdiPure Carbon? I don't. Besides maybe that the Carbon one is heavier, its guard width is not adjustable and...is more expensive. If someone knows, please share it with me. I'd really appreciate it. Seriously. I've searched and asked everywhere, including Adidas' Customer Relation Department, without much of a success. At first I thought it was no brainer. One is made out of chrome and the other of carbon. Simple, right? Well, I couldn't confirm it anywhere and then I thought even if that's true, wouldn't the AdiPure Carbon be lighter than Chrome one? Selecting Soccer Shin Guards - arguably the most annoying piece of equipment in the eyes of soccer players. Factors to consider, recommendations, reviews and tips. Nike Shin Guards - Which of the Nike Shin Guards should you buy? Recommendations and reviews with tips on all Nike shin guards currently on the market. 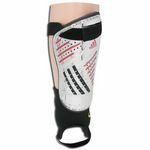 Adidas Shin Guards on Ebay - Before you purchase Adidas shin guards anywhere else, discover Adidas soccer shin guards on Ebay auction right now! It's live straight from Ebay. 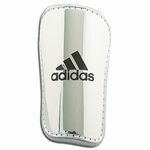 There is a good chance that you'll find here better deal on brand new Adidas shin guards than at any store.